Be the last one standing on the ice platform! Kick and punch foes. You can also use Buzzy Beetles to attack. Hop on a Buzzy Beetle to stun it. Then hop onto the critter to send it at a foe. Glacial Meltdown is a Battle minigame in Mario Party 8. The minigame opens with the four characters on an iceberg. When a Buzzy Beetle comes, they are scared by it. However, one of the characters knocks the Buzzy Beetle back into the ocean. The characters are on a large chunk of ice, attempting to knock all the other players off. A Lakitu floating above the iceberg drops Buzzy Beetles; although these Buzzy Beetles hurt characters, they can prove themselves helpful in that their shells can be kicked into opponents if jumped on. Whoever is the last one standing wins. If all four characters fall off the platform, the player who last fell off will win the minigame. If the 5 minute time limit expires before three players fall, the remaining players win and split all the coins in the pot. The last player standing does a victory pose while all 3 other players are on separate icebergs farther away. If the last player standing falls in the water, he or she will pose their victory on the farther icebergs, next to the other three players that lost. Plus, since the winner poses his or her victory that far, their voice can barely be heard at that distance. 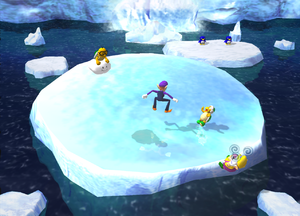 If five minutes pass without 3 players falling, the remaining players will do their victory poses while the other players are on the distanced icebergs. Although Lakitus throw Spinies in most games, the one in this minigame tosses Buzzy Beetles instead. This page was last edited on April 22, 2018, at 17:08.